Citation Information: J Clin Invest. 2002;110(4):483-492. https://doi.org/10.1172/JCI15449. Schematic diagram of the metabolic study-day protocol. Arrowheads denote time points for blood draws, breath sample collections, and muscle plasma flow measurements. 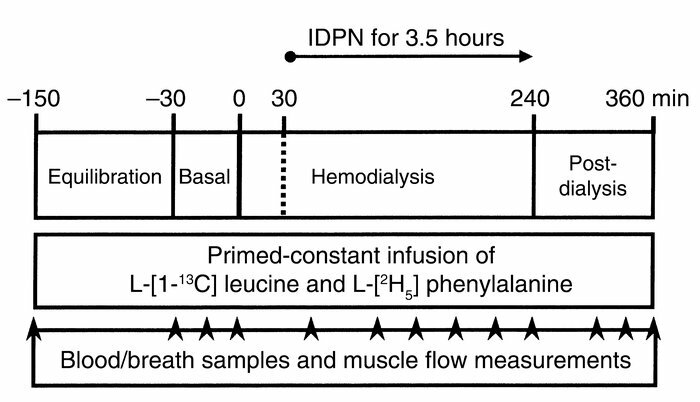 A primed-constant infusion of L-(1-13C) leucine and L-(ring-2H5) phenylalanine was maintained throughout the entire study (360 minutes).